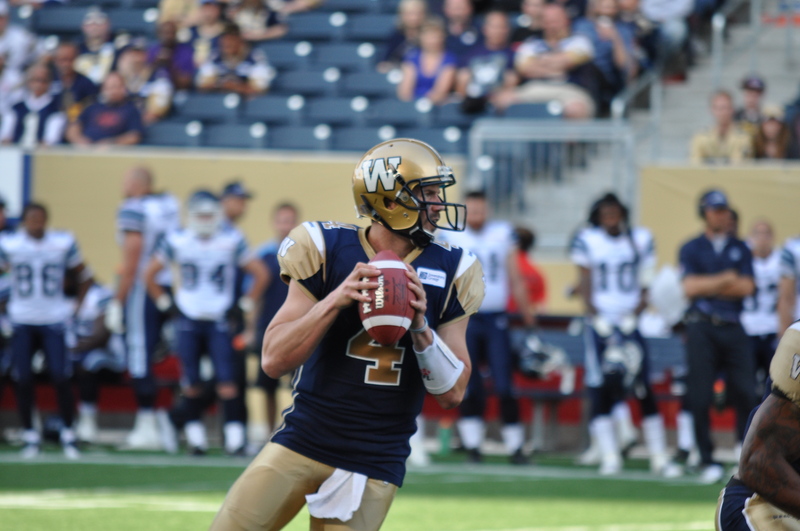 Investors Group Field opened with a bang last Wednesday, but it wasn’t an opening drive touchdown for the home team. No, it was more like a multi-car collision on the east perimeter, one kilometre from the merge to Pembina, closing the right lane 90 minutes before kickoff. That misfortune would set the tone for the evening. The concessions were also in shambles. Lines were longer than at the old barn, and perhaps more concerning was how slowly they moved. While some of the disorganization and wait time for food could be attributed to it being the “pre-season” for concession employees as well, the problems also stemmed from the heavy traffic. Concessions were understaffed; some did not even open fully because one-fourth of the staff were stuck in traffic, unable to make it to the game in time. Having an open concourse does allow fans to watch the game away from their seats, but not if their backs are to the field as they wait in line, with the crowds lining the edge of the concourse blocking their view from a venue held together by steel anchors. The action on the field did not fare much better. With all the hype around the inaugural game at the new stadium, it remained pre-season football – boring, dull football with little on the line. On the Bombers post-game radio show, Doug Brown said that if he saw too many of these types of games he would be turned off by the CFL. And he was absolutely right – it was bad. What made this pre-season game even less enjoyable was the performance by the home team. Buck Pierce went 0-for-5 with an interception, and was hit three times. Speculation was that he would get a quarter of action, but coach Tim Burke quickly pulled him after watching Argonauts defensive coordinator Chris Jones pull out the blitz package on the first couple of plays against the injury-plagued quarterback – a questionable move considering it being the pre-season. Quarterback Max Hall was a pleasant surprise, as he orchestrated a 10-play, 63-yard scoring play capped by a 34-yard Justin Palardy field goal (three of the Bombers’ six points), and showed some of the ability that made the Arizona Cardinals invest in him after college. Rookie cornerback Marty Markett made a name for himself with blazing speed and a couple of pass knockdowns in coverage. He is definitely one of the young guys making it easy for Burke to put pressure on veterans in the secondary, like Jovon Johnson and Johnny Sears. But besides Mike Renaud recovering one of his own punts, and an exciting 91-yard missed field goal return by Jameze Massey, it was a very quiet night for the 28,000 in attendance. Considering last year’s pitiful results, maybe instead of parking, the Bombers should have worked on a nine-point plan on how to win nine games. The stadium itself is gorgeous, and maybe it isn’t fair to wait until now to mention that, but it is hard to appreciate the sight lines, improved sound, and increased leg room when it takes an hour to get in and out, 30 minutes to get some food, and the game itself is awful. Trevor Panchyshyn, a six-year season ticket holder of the Bombers, called the night his “worst football experience ever.” That is something I am sure the Bombers were not expecting to hear from fans leaving their $200-million stadium. But the Blue Bomber front office has acknowledged that things must be fixed. After all, it was their trial game too. And just like adjustments have to be made on the field before the home opener against Montreal later this month, changes have to be made off the field as well.